The Asian American Pacific Islander (AAPI) Heritage Month Commemorative Event is Thursday, April 11, at 7 p.m. in Slocum 214. As a signature event during the monthlong celebration, the evening will include a comedy act with Joel Kim Booster, a Q&A with Booster moderated by Jasmine Kim ’19 and a meet-and-greet session. All are welcome to attend this free event. AAPI Heritage Month consists of programs and signature events that educate of the histories, cultural diversity, contributions and often underreported challenges of Asian Americans and Pacific Islanders. Celebrated nationally in May, Syracuse University honors the month in April to celebrate while the campus community is still together. This year’s commemorative event features comedian and writer Joel Kim Booster. Booster is a Chicago-bred, Los Angeles-based comedian and writer. 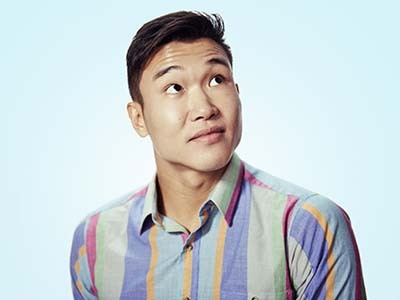 He has appeared on audience favorites such as “Conan” and “The Late Late Show with James Corden.” In 2017, Booster recorded a special for Comedy Central’s “The Half-Hour,” a full-length stand-up album called “Model Minority” and was listed as one of Esquire’s “10 Comedians to Watch.” Booster recently made The Wall Street Journal’s “Young Hollywood Portfolio,” and Forbes’ 2018 “30 Under 30” list in their Hollywood and Entertainment category. This event is sponsored by the Office of Multicultural Affairs and the LGBT Resource Center. American Sign Language (ASL) interpretation and Communication Access Realtime Translation (CART) will be provided. For questions about the event, contact Hsiao. This article was written by Division of Enrollment and the Student Experience communications intern Currie Murch Elliot ’19.